Over the years, we have been asked a lot of Lockout/Tagout-related questions. Some questions pertain specifically to the OSHA 29 CFR 1910.147 standard, while others pertain to the DEenergize Lockout/Tagout services, methodologies and devices. Lockout/Tagout refers to the procedures established for Control of Hazardous Energy, as described by the Occupational Safety and Health Administration (OSHA) under Federal Registry 29 CFR 1910.147. Lockout/Tagout ensures employee safety during inspection, Maintenance, or service of equipment by controlling all energy flow to and from the equipment. To achieve system Lockout, all energy sources are turned off or disconnected, and Stored Energy is released, restrained, or Dissipated. A lock or Lockout Device applied to each Energy Source prevents accidental startup. Tagout refers to application of warning tags to energy sources to ensure the equipment is not restarted until service has been completed. Tags may be used with locks for enhanced safety assurance. Where Lockout is not possible, tagout may be an alternative. Tagout alone is not as secure as is lockout. What is a Lockout/Tagout Program? Training for employees includes classroom and hands-on instruction. Authorized employees must demonstrate their proficiency in startup and shutdown procedures. A copy of OSHA 29 CFR1910.147 should be readily available for reference. Who must have a Lockout/Tagout Program? All companies whose employees service or maintain equipment with potentially Hazardous Energy sources must have an OSHA-compliant Lockout/Tagout program. Lockout/Tagout applies whenever the employee performs service or Maintenance on equipment/machinery that requires the employee to remove or bypass a guard or safety device or requires the employee to place any part of his/her body at the point of operation of the equipment/machinery. When does Lockout/Tagout NOT apply? Lockout/Tagout does not apply to cord- and plug-connected equipment where the cord and/or plug are under the control of the Maintenance employee throughout the repair; hot tap operations; or when shutdown of the system is impractical. What are typical activities where Lockout/Tagout does apply? Typical activities where Lockout/Tagout would apply are cleaning, repairing, Servicing, setting up, adjusting, and unjamming prime movers, machines, and equipment. What is the minimum we must we do to be in Lockout/Tagout compliance? 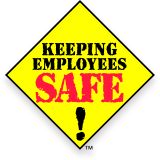 Classify employees as "affected" or "authorized"
Which employees are at risk of injury? Authorized Employees or Persons - A qualified person who locks out or tags out specific machines or equipment in order to perform cleaning, repairing, servicing, setting up, and adjusting operations on that machine or equipment. An Affected Employee becomes an Authorized Employee when that employee's duties include performing cleaning, repairing, servicing, setting up, and adjusting operations covered under this section. Affected Employees - An employee whose job requires them to operate or use a machine or equipment on which cleaning, repairing, servicing, setting up or adjusting operations are being performed under lockout or tagout, or whose job requires the employee to work in an area in which such activities are being performed under lockout or tagout. What is the difference between an authorized and an affected employee? An authorized employee is one who performs Lockout/Tagout in order to conduct service or Maintenance on equipment and machinery. An affected employee is one who works in or around the area in which service or Maintenance is being performed. An Affected Employee is not permitted to perform the Lockout/Tagout procedure. What are normal production Operations? Normal production Operations can be described as using machines or equipment to perform their intended production functions. What about the safety of outside maintenance and repair contractors? In addition to ensuring the safety of its own employees, the employer is responsible for the outside Contractor's on-site personnel. The Lockout/Tagout program must include policies, procedures, supervision, and authority for service involving contractors. Does OSHA endorse or approve a Lockout/Tagout service or a product? OSHA does not endorse or approve any service or product in order to negate conflict of interest. Under OSHA 29 CFR 1910.147 standard, the requirements for Lockout devices are not quantitative, making it difficult to provide the rationale on a decision one way or the other. How durable are the DEenergize Lockout/Tagout procedure placards and tags? The final DEenergize Lockout/Tagout procedures and energy control device identification tags are printed with high-quality, UV-resistant ink on state-of-the-art color printers. The output is then sealed and protected in 20-mil polyester. All materials used in the manufacture and mounting of our Lockout/Tagout procedures and labeling resist damage due to exposure to lubricants, solvents, UV light, temperature extremes and physical abuse. Copyright © 2019 St. Claire, Inc. ♦ DEenergize is a trademark of St. Claire, Inc.